Penn quarterback Ryan Glover throws to teammate Abe Willows during the second quarter against Bucknell. 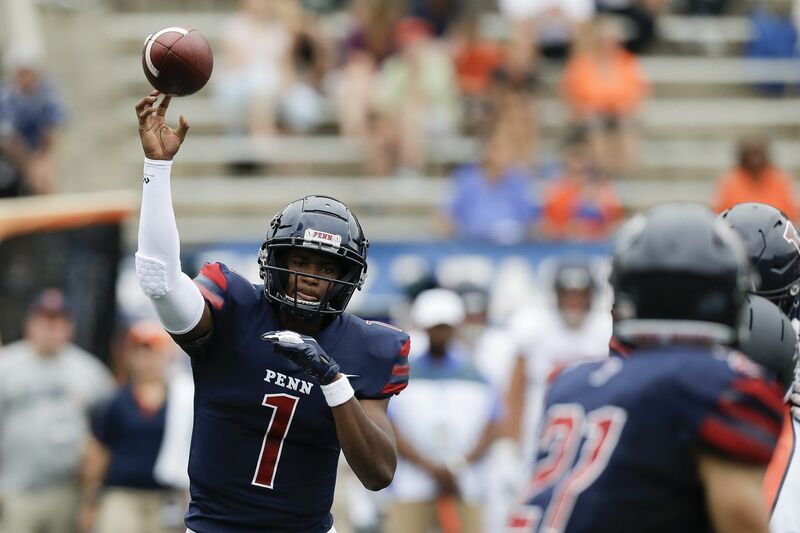 Penn coach Ray Priore knew there would be growing pains to deal with when he named sophomore quarterback Ryan Glover this season's starter. As a freshman, Glover played in just one game and completed the two passes he threw for 12 yards. He also rushed two times for 5 yards against Princeton. Still, Glover had been recruited out of Woodward Academy in Atlanta as the Georgia AAAA player of the year in 2015 and 2016. His upside led Priore to start him this year over junior Nick Robinson, last season's backup. In the Quakers' season-opening, 34-17 win over Bucknell, Glover was just what Priore expected: Glover made some plays that flashed potential greatness and made some mistakes that highlighted his inexperience. He completed 12 of 21 passes for 138 yards, with touchdown passes of 33 yards to Tyler Herrick and 11 yards to Kolton Huber. A prep letterman in track, the 6-foot-2, 205-pound quarterback also displayed his dual-threat ability by rushing for 48 yards. On the flip side, Glover threw two interceptions and fumbled on one of his carries. Glover "absolutely" showed the predictable ups and downs of a first-time starting quarterback, Priore said. "The two balls he threw for touchdowns were outstanding throws," the coach said. "What I liked was that, on the day, he made no poor decisions with the ball. We always talk about making the right decisions, and sometimes the right decision is to throw the ball into the stands. "The loose ball [on the fumble] is the thing I'd probably critique the hardest," Priore said. "It was a lot of those first-game situations, where a kid learns a lot by playing those live scenarios. "Glover showed poise under fire, he scrambled, not throwing the ball and trying to force things. That was a great first step in his development." Penn quarterback Ryan Glover runs with the football against Bucknell. Priore said he went into training camp thinking that Glover and Robinson would have an equal shot at winning the starting job. "They both battled real hard," Priore said. Robinson "tweaked his hamstring in camp, which set him back a little bit, but in the end, I think Ryan just stepped out up in front." The dual-threat quarterback is no longer a gimmick in football. That skill set has become welcomed at all levels of football. "You watch football and see what it's becoming right now," Priore said. "Ryan can give us some of those things." Penn wide receiver Steve Farrell looks for running room against Bucknell. Records: Penn (1-0); Lehigh (1-2). Coaches: Ray Priore, 21-10, in fourth season at Penn; Andy Cohen, 83-58, in 13th season at Lehigh. Radio: WFIL (560 AM) / WNTP (990 AM). History: Penn won, 65-47, last season, and leads the series, 45-15. Junior Karekin Brooks made his first career start against Lehigh in 2017 and carried 29 times for 268 yards, which ranks second all-time for a Penn running back. Brooks ran for three touchdowns and also threw a touchdown. His 68-yard touchdown run was called back because of a penalty. Senior safety and tri-captain Sam Philippi suffered a serious hip injury against Bucknell that required a stay in the hospital. He will not play against Lehigh, and there is no indication whether he will return this season. Penn had 10 sacks against Bucknell, led by senior lineman Cooper Gardner; it was the Quakers' highest total since getting 10 against Yale in 2001. They totaled only 18 sacks last season, with a game-high of three. Seven Quakers were credited with at least a half-sack on Saturday.